Windows Vista comes with a “kill switch” – “Reduced Functionality Mode” (RFM) that forbids and blocks normal usage of Windows Vista when users do not activate the system with legitimate product key within 30 days grace period, or when Windows Genuine Advantage (WGA) validation detects and invalidates the cracked system. Microsoft promised in December 2007 to kill the “kill switch” in Service Pack 1. Indeed, the RFM kill switch which only allows web browser to work for maximum of one hour has been removed from SP1. Black desktop background after logging in. Users can change back the wallpaper to their favorite images, but the system will reset the desktop background to black every hour. 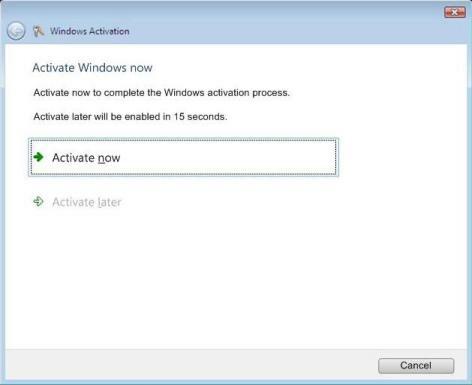 On every logon, a “Activate Windows Now” message will be displayed to direct the customer to activate that copy of Windows. Users can choose to dismiss or activate later, but the button to activate later will only be enabled after 15 seconds delay. A balloon notification nag message will consistently and constantly pops up at notification area (system tray), reminding and alerting users to activate Windows and that you’re using non-genuine Windows. 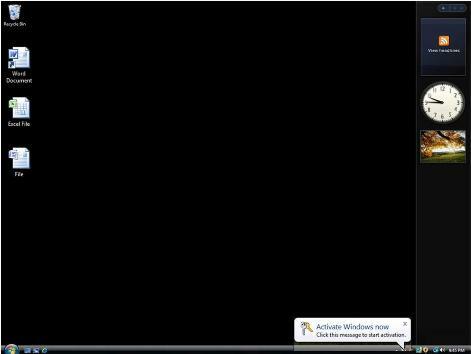 Every one hour, the system will prompt a message to ask user to purchase genuine software and activate Vista. As with all options, users also presented with a number of ways to activate their copy of Windows. If a activation exploit is detected, a download link is provided for the removal tool.